Francis was an influential bishop, spiritual director, author and preacher. "To be an angel in prayer and a beast in one's relations with people is to go lame on both legs." Summary of St Francis de Sales, Bishop, Doctor of the Church. Born in Savoy (France) in 1567; died in Lyons in 1622. As a presbyter and as bishop of Geneva, he played a major part in the renewal of 17th-century French Catholicism. Seen by many as an early proponent of ecumenical dialogue. Founded the Visitation order with Saint Jane Frances de Chantal (12 December). His writings promoted a spirituality for laypeople. Honoured as a most influential preacher, writer, and spiritual director, who combined firmness with patience and gentleness. 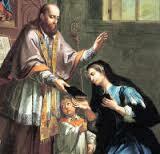 St Francis de Sales lived in the troubled times that followed the Protestant Reformation. He was an influential bishop, spiritual director, author and preacher. With St Jane Frances de Chantal, he co-founded the Visitation nuns. Patrick Duffy traces his life. Francis was the first of twelve children born into a Savoyard noble family, near Annecy in Savoy. A delicate child, he was educated privately at first, but later went to Paris. His father wanted him to become a lawyer. Francis studied rhetoric, philosophy and theology. From there he went on to Padua where he became a doctor of law. Already he had decided to become a priest and was probably still in a state of tension with his father when he was ordained in 1593. Since the Reformation, the seat of the Catholic diocese of Geneva had been moved to Annecy. The bishop of Geneva, Claude de Garnier, appointed Francis provost of the cathedral chapter. Francis soon distinguished himself for his service of the poor. In a preaching campaign throughout the Chablais area south of Lake Geneva he succeeded in winning back many Calvinists to Catholicism. 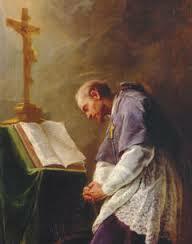 He also wrote and distributed a series of pamphlets explaining true Catholic doctrine. Francis was made coadjutor bishop in 1599 and travelled to Rome where he made friends with Robert Bellarmine and Cardinal Camillo Borghese who later became Pope Paul V. In 1602 after the diocesan bishop died, Francis succeeded to Geneva. Francis preached during Lent in Paris at the court of King Henry IV, Henry of Navarre. Though a Protestant, Henry sought to bring peace and freedom to France. In 1598 Henry enacted the Edict of Nantes guaranteeing religious freedom to Protestants. Henry is said to have offered Francis a bishopric if he would stay in Paris. Francis replied: “Sir, I have married a poor wife and I cannot desert her for a rich one”. While preaching in Dijon Francis noticed a widow Baroness Jane Frances de Chantal listening very attentively to his sermon and spoke to her. Jane wanted Francis to be her spiritual director. At first, he was hesitant. Jane was on a path to mystical union with God and, in directing her, Francis was compelled to follow her and become a mystic himself. Through a number of coincidences they were given a building in Annecy and were able in 1610 to found the community of Visitation Sisters, whose most striking characteristics were not difficult penances, but moderation and common sense. At that time, the prevailing idea was that holiness was only for monks and nuns and not for ordinary people. Francis changed this by giving spiritual direction to lay people living ordinary lives in the world. He knew from his own experience that people who live a very active life can also grow in holiness. Two of Francis’s books, The Introduction to the Devout Life and the Treatise on the Love of God, became best sellers among the laity.He believed that the key to love of God is prayer: “By turning your eyes on God in meditation, your whole soul will be filled with God. Begin all your prayers in the presence of God.” For busy people of the world, he advised: “Retire at various times into the solitude of your own heart, even while outwardly engaged in discussions or transactions with others and talk to God.” The test of prayer is a person’s actions: “To be an angel in prayer and a beast in one’s relations with people is to go lame on both legs.” The worst sins, he believed, are gossip and making judgements: even if we think we do them out of love, we’re actually doing them to make ourselves look better. And we should be as gentle and forgiving with ourselves just as we ought to be with others. “More flies are attracted by a spoonful of honey than by a whole barrel of vinegar”. 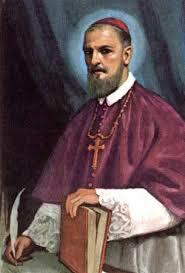 Because of his writings and his idea of distributing of pamphlets, Francis de Sales is the patron saint of journalists. Every year since 1967, on his feast day, the Pope issues a Message in preparation for Communications Sunday, the Sunday of the Ascension.